On the last Thursday in August I went to the Waterfront Tavern to check out the first public event held by a group calling itself Citizens for the Revitalization and Urban Success of Holyoke — or, more succinctly, C.R.U.S.H. At the event, there were snacks; there was a Duraflame in a fire bowl; there was a survey asking about the city’s strengths, weaknesses, and most important priorities. There were also a lot of people discussing a lot of exciting ideas and visions for Holyoke. Last week, I caught up with one of those people — Holyoke At-Large-Councilor Rebecca Lisi — to learn more about C.R.U.S.H. Right. And he was always talking about the issues, and about the need to get people involved, and I told him I had the same ideas, the same feelings. He was talking a lot about how he’d tried to create a newsletter, and how everyone who talks to you talks the same way about the issues — but nobody seemed to be able to follow through with action. I come from organizing experience, and I think one of the most important things you can do is to follow through on an idea. So we sent out a mass e-mail to set a date to talk about forming a young professional society, which was the original model. We went to a young professional society meeting in Northampton — the Wednesday before the first Sunday that we met — and I took notes and asked questions: How did you guys get developed? Where did it come from? Who sponsors you? How did you organize? I presented that to the group that met on Sunday — it was a lot of James and Becca Sutter’s friends, as well as other folks who were interested in redeveloping the city — and I explained what the original concept was. I told them I wasn’t wed to it, that I wanted to hear what they thought would work, what they thought would help. What we decided was that we didn’t want to be exclusively young; we didn’t want to be exclusively “professional”. And, even more so, we couldn’t afford to be exclusive in any way, shape or form, because the city is really lacking organization overall. So we wanted the group to be a place where people could come together, to get organized around ideas and vision, talent, energy. We really needed to throw the net wide and welcome everybody in. So that’s why you saw the generational diversity, probably even class diversity. It was a mix of artists and people from the business community, as well as people who’ve been around and who’ve been doing business in Holyoke for some time, like David Scher from the Canal Gallery. He was really happy to be there. And he sort of straddles the art and business communities. So it did seem to draw from a wide crowd. And one of the things we decided is what we’re not going to be — we’re still hammering out what the function and organization of this group is. The one thing I think is really important is that we’re mostly a place where people can connect — to the organizations, resources, the other people who will support the different ideas that you and your friends and your neighbors have about what needs to be done. So it’s just a place, a space we’re creating where all of that can happen. If I’m remembering, when you spoke the other night you used “silos” as a metaphor for how people and organizations are separated or disconnected in the city. Can you talk more about the disconnect that exists in the city, and how you’re trying to overcome it? The idea of “silos” is very prominent in my mind, because the first way I started connecting with the city, being a newcomer, was through the youth-serving agencies, and the Holyoke Youth Task Force. The agencies had been struggling a lot with replication of efforts, really feeling that they’re in silos due to funding restrictions, funding constraints, funding competition, and the Task Force was a place where they could network and share ideas. And it really, in my eyes, permeates a lot of what’s happening beyond just the social service agencies. The business community isn’t talking to the artist community, and the artist community isn’t talking to the community groups — there are lots of things happening, but the word is not getting out. There are lots of people — there’s Friends of CanalWalk now, there’s the Taxpayers’ Association, the Chamber, all these social service agencies, that are all doing really good work — but we’re not getting a synergy so that you can see a measure of real difference in the city. So James and I have both been talking to different groups, different people, and we’re finding that there’s a common theme; we’re all focused on the same thing. We all want to see the city succeed. We all want downtown to be revitalized. We all want to see business come back. We want to see a revival of the middle class, of a working community here in Holyoke. We all have different talents, and we all have different ways of going about doing that. […] You have your skills, your talents, and I need to connect you to the people who need those skills and talents. There’s a nice exchange that can happen if you bring everybody to the table. Since you’d originally envisioned a young professional society, it makes me wonder — is Holyoke, as a city, getting younger? Is there a growing pool of young entrepreneurs and business people in the city, and is that an increasingly important force in city politics and in the city’s business community? I don’t have actual statistics. My sense is that our generation — people currently in their twenties and thirties — I think they have a very entrepreneurial spirit. And there is so much potential, and so many available resources in this city that it’s like a blank canvas. So I think that a lot of entrepreneurs and people who have brilliant ideas see this as a canvas, in a way. It gives a chance for individuals with ideas to express themselves. I think there’s a pull in the city, because of all its needs. People are stepping up and saying, “Well, the city has needs, but I have needs too.” And there’s a good match there. It seems like there’s ample space, and it seems like the city is calling out for activity. So, you can really be a pioneer, in a way. And that’s really the entrepreneurial spirit — going into a place and creating something where there is nothing. You talked the other night about having fun this fall, and then really hunkering down and creating sub-committees to work on different projects. Can you tell me more about how you see this group evolving over the next several months, and what the work of C.R.U.S.H. will be like starting in the new year? There are two parts that I see as the foundations. One is the fun, the social networking part, which is what we drew from the young professional society. Because there needs to be an element of fun and lightheartedness, and to acknowledge that it’s in our own interest to meet people in our community, and to create community and create social bonds. And there are new people mixing with people who’ve lived here a long time, young people mixing with older people, and they’re interested in knowing who is in the city. The other foundation is action. I feel like as far as I’ve lived in the area, I’ve heard people talking about Holyoke coming back. And while there are individual projects that have been successful, I feel like there hasn’t been a real groundswell of movement to really signal that success. So we really need to focus on creating concrete and tangible goals and following through on them. That’s really important to me, and to the other folks who we’re working with. We expect more from the city, and we’re not expecting anyone else to take care of it. And we feel like we have skills, we have talents, we have the energy, we have the vision to start implementing the things that we want to see. Check back on Wednesday for Part II of our conversation. 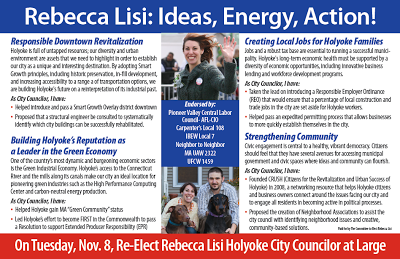 Rebecca Lisi: Ideas, Energy, Action!